Unassuming leader pitches pragmatism with characteristic optimism. L. Tom Perry, Quorum of the Twelve Apostles, speaks during the afternoon session of the 180th Semiannual General Conference of The Church of Jesus Christ of Latter-day Saints Saturday, April 3, 2010. 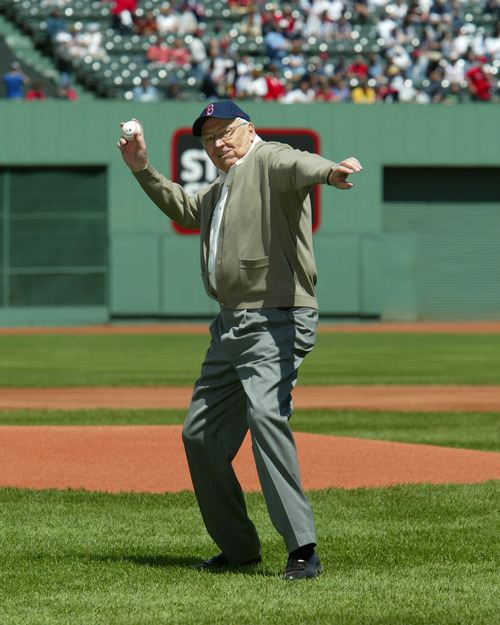 L. Tom Perry, an LDS apostle, throws the ceremonial pitch during Mormon Night at a Red Sox game in 2004. He was 82 and the pitch was considered "an inside strike." Courtesy of the family. 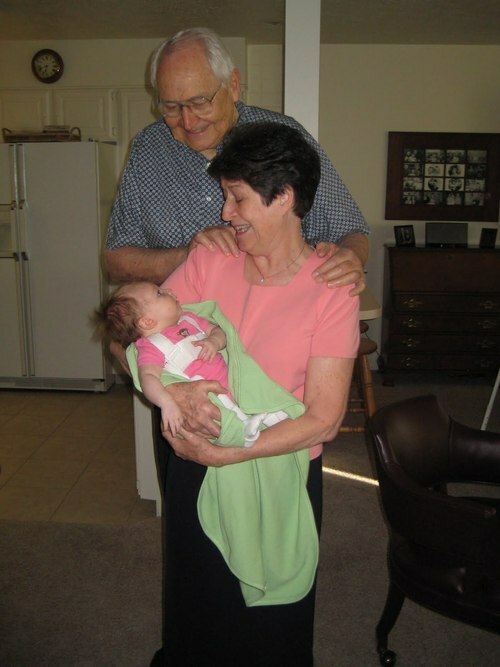 L. Tom Perry and his wife, Barbara, holding a great-granddaugher, Jane Thomas. Courtesy of the family. 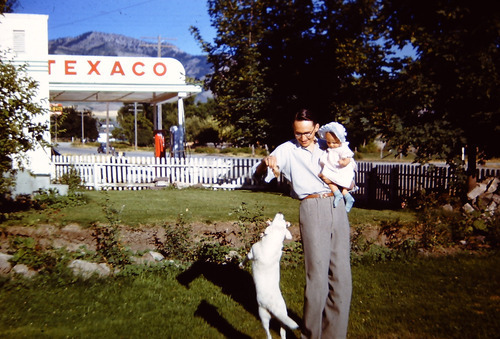 L. Tom Perry, holding his daughter, Barbara Perry, while playing with their dog in 1950 in Hyde Park, Utah. Courtesy of the family. 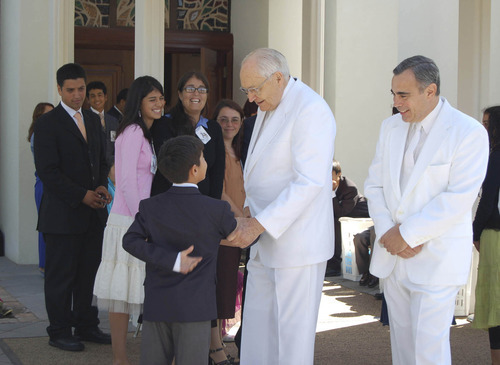 LDS apostle L. Tom Perry, center, who oversees the church in South America ,and Area President Francisco Vinas, right, in their temple whites greet young Chilean member after a dedication. 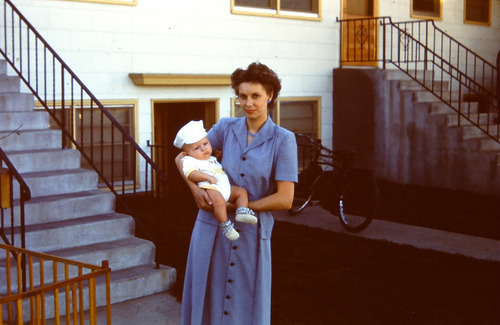 Tribune file photo L. Tom Perry's first wife, Virginia Perry, holding their son, Lee Perry, 1951 in Boise, Idaho. Virginia died in 1974. Courtesy of the family. L. Tom Perry, with big hands and an even bigger grin, is the oldest and tallest living Mormon apostle. He also might be the least well-known. And that, say those who know him, is no accident. At age 88, Perry is one of the so-called "Greatest Generation" who served in World War II, but never boasts of it. He moved his family from one coast to the other, adapting to each new location with boyish delight. He relished sharing Mormonism at the 1964 World's Fair in New York. He dealt with the death of his first wife with quiet dignity and relentless optimism. Perry reached the top of his profession in retail sales and met every assignment the Utah-based Church of Jesus Christ of Latter-day Saints handed out the same way  with energy and enthusiasm. But none of it gave him a bloated sense of importance or entitlement. "My father doesn't need to be the center of attention," says his son, Lee Tom Perry, a Brigham Young University management professor. "He is a listener who brings out the best in others. There is no ego in the man, no hidden agenda." Helen Claire Sievers, who worked with Perry in the early 1970s when he was an LDS stake president in Boston, says he was "the most empowering person [she] ever worked for." Being around him was "almost always a joyful experience," Sievers writes in an email from India, where she is working with an orphanage. "He had a twinkle in his eye that was infectious, and you'd find yourself smiling at him, and at the world. … It made you want to work your heart out for him." Although second in line for the church presidency  after senior apostle Boyd K. Packer  Perry is unpretentious and modest, claiming to be "common as dirt." "He never wanted me to call him 'Elder Perry,' " says former Weber State University President Paul Thompson, who has known the LDS leader for 40-plus years. "We were just Tom and Paul." Young Tom Perry grew up in northern Utah, where his father was the bishop of the Logan Ninth Ward for nearly 20 years. According to a biography in the church's Ensign magazine, Perry was a neighborhood leader. "No umpires were needed for their ballgames," the article said, "because he had an unusual ability to arbitrate disputes." That doesn't mean he wasn't competitive. As a teen, Perry played "vanball," a modified form of volleyball, and led his team to the all-church title in 1940 as captain. After high school, Perry served an LDS mission in Ohio, Iowa and Illinois, and then, weeks after returning in 1943, joined the Marines. He was among the first wave of American troops in Japan. "Entering the devastated city of Nagasaki was one of the saddest experiences of my life," Perry said in the video "Special Witnesses of Christ." Perry, who declined to be interviewed for this story, and a group of servicemen volunteered to repair and replaster bombed-out Christian churches during their off-duty time. As the Americans were leaving the country, about 200 Japanese Christians greeted them, singing "Onward, Christian Soldiers" and showering them with gifts. "We couldn't speak; our emotions were too strong," Perry said in the video. "But we were grateful that we could help in some small way." In 1947, Perry married Virginia Lee in the Logan LDS Temple. Together, they reared three children  Barbara, Lee and Linda Gay  while Perry built a career with department stores. He first worked in Boise, then in Sacramento. In 1962, he took a job in New York with Aimcee Wholesale Corp. Four years later, he joined Lechmere Sales Corp. in Boston, then became treasurer of R.H. Stearns, a department store chain. His work demanded six days a week, with church callings on top, so Perry had to get creative to squeeze in the family. The future apostle's solution: Make some days sacrosanct. Monday nights were reserved for Family Home Evening, Friday for dates with Virginia and Saturday mornings for work around the house. He also made it a habit to take his only son with him as he drove around the LDS stake (similar to a far-flung diocese). The twosome would chat about sports, school, the church. Then Perry would enlist the boy to help with his sermons as a way of keeping him engaged. "We had hand signals," Lee Perry says. "If he slouched, I would cover my eyes [from the audience]. If he was speaking too loud or too long, I would cover my ears." Perry loves a good story and is quick to laugh  even at himself, his son says. The kids loved to rib him about doing things such as labeling his hangers for easy dressing. Though routinely playful and positive, Perry dug deep into his emotional resources when his first wife was diagnosed with cancer. Together, the couple would seek solace with frequent visits to the Walden Pond of Thoreau fame. "When my wife was feeling strong enough, we'd go for a walk around the pond," Perry recounted in an October 2008 conference speech. "Other days, when she did not feel up to the exertion of walking, we'd just sit in the car and talk. Walden Pond was our special place to pause, reflect and heal." In 1974, eight months after Perry became an apostle, his wife, Virginia, died, which was devastating to him, his son says. But the grieving father dealt with his loss by turning his attention to his daughter Barbara, who still was in high school. (Cancer also claimed Barbara Perry Haws 28 years ago.) And by steadily marching forward. He married Barbara Taylor Dayton in 1976. "Of all the things I admire most about my father, it's the way he can take what comes and not be knocked down by it," Lee Perry says. "He just has this resilience, this hardiness that helps him." His faith in God, the son says, "is at the core of it." Perry became the leader of Massachusetts Mormons in January 1970, presiding over 10 congregations that nearly spanned the state. It was there he stood out as an open-minded, innovative leader. He kept meetings short and didn't dwell on problems, recalls Mormon historian Richard Bushman, who was briefly Perry's counselor. "If a counselor came to a meeting with a solution, he would accept it and move ahead. Decisions came easily to him. He had the knack of resolving an issue with a bold stroke." When bishops in Boston complained about members not meeting their budget commitments, Perry suggested they offer a 2 percent discount if they paid on time. "It seemed to work," says Thompson, who did his graduate work at Harvard. "I thought, 'Here's a pretty creative stake president.' "
Perry was willing to adapt programs to meet needs, Sievers says. She and her male counterpart suggested that the Young Men and Young Women groups be coordinated by a man, with a woman and two men as counselors  one to head the Young Women's classes and activities only for them, one for the Young Men's classes, and one to head all the activities and programs that involved everyone. The move would free up some leaders and clean up the organizational lines. After some probing questions, Perry agreed, and the system worked wonders. Young Mormons loved it and their attendance improved. That experience "was so totally absorbing I pretty much missed the women's movement in the early 1970s," Sievers says. "I always felt with him it was about competency, goodness and caring and never about gender." Perry has maintained close friendships from those Boston days for decades. And, in 2004, he tossed out the first pitch on Mormon Night at the Red Sox's historic Fenway Park. The 6-foot-4 octogenarian hurled the ball with power right over the plate, Lee Perry says. "It was an inside strike." In October 1972, Perry was tapped to work in Salt Lake City as an assistant to the Quorum of the Twelve Apostles. Eighteen months later, he became the newest apostle. One of his first assignments was with LDS finances. So he sought advice from an old Boston friend, the late Gene Dalton, then professor of organizational behavior at BYU. Perry wanted to know the latest, best thinking in the fields of business, management and leadership, Thompson says, and arranged to come to Provo once a month for tutorials. Later, the apostle asked Dalton to circle the globe, interviewing LDS members and mission presidents to discover how to manage the church's growth. "We don't have anybody in charge out there," Perry said at the time. Not long after Dalton concluded his research, the church created a level of leadership known as Area Presidencies. Then, in 2004, Perry got a chance to study the problem himself. LDS President Gordon B. Hinckley asked Perry to move to Frankfurt, Germany, for two years and watch over the church in Europe. When Perry replied, "I can't do that, I'm 82," Hinckley shot back, according to Thompson, "I'm 94. What's your point?" And so, like a good soldier, Perry went overseas and, once again, threw himself into the task of energizing the faithful. The night before he left, the apostle reported a powerful impression that he should create an "Outreach Initiative" for youths between ages 18 and 30 to gather at LDS Institutes of Religion near college campuses. The program was implemented, but it wasn't easy. 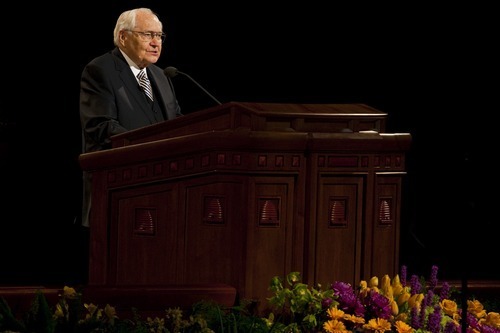 "I have learned from my current [European] assignment that sharing the gospel of Jesus Christ involves challenges I had never before imagined," Perry said in a 2005 General Conference address. Yet, he added, "every day I see new signs of hope." After one General Conference, a well-dressed couple were lying horizontal and kissing in a pickup truck on a downtown Salt Lake City side street. Suddenly, they heard Perry, who was walking home, say over their shoulders, "Nice day, isn't it?" The young man stammered, "Yyyyyessss, it IS a nice day," according to his friend, Jeff Bennion, who wrote about the episode at mormonmentality.org. Then Perry added, "Why then, let's keep it that way." No stern lecture, no dogmatic sermon, but a clear Mormon message about sexual morality. That, friends say, is Perry's style. His conference talks have centered on embracing and celebrating family relationships  father, mother, children  as a reflection of the fatherhood of God. And he treats members with the same openness and affection as the men who serve with him in the Quorum of the Twelve. In 1973, Denver Snuffer was a Mormon convert of just 20 days in Portsmouth, N.H., when he got leave from the Air Force to attend the church's October conference. Several Mormons there suggested he give their regards to Perry, their previous church leader. Without knowing protocol, Snuffer showed up unannounced at the LDS Church Administration Building in full uniform, asking for Perry. The receptionist, dubious about bothering a church official in the midst of the conference frenzy, reluctantly put in a call to Perry's office. Within minutes, Perry, then an assistant to the Twelve, emerged from the elevator and enthusiastically greeted the soldier. "I had no understanding or appreciation that this guy was one of the church's top leadership," says Snuffer, now a Salt Lake City lawyer. "He was warm, friendly and gregarious, interested in hearing about the church in New Hampshire. He didn't seem hurried or annoyed, just homespun and welcoming." When the conference was held in the Mormon Tabernacle on Temple Square, Perry would arrive a half-hour early to walk up and down the aisles, shaking hands and greeting people  always with his trademark enthusiasm. Even during his darkest hours, Perry has strived to remain upbeat, something he has counseled all Mormons to do. "One of the challenges of this mortal experience," he said in October 2008, "is to not allow the stresses and strains of life to get the better of us  to endure the varied seasons of life while remaining positive, even optimistic." And, in Perry's case, unassuming. Born on April 5, 1922, in Logan. "Those of us who have been around a while … have recognized certain patterns in life's test. There are cycles of good and bad times, ups and downs, periods of joy and sadness, and times of plenty as well as scarcity. When our lives turn in an unanticipated and undesirable direction, sometimes we experience stress and anxiety. One of the challenges of this mortal experience is to not allow the stresses and strains of life to get the better of us  to endure the varied seasons of life while remaining positive, even optimistic. Perhaps when difficulties and challenges strike, we should have these hopeful words of Robert Browning etched in our minds: 'The best is yet to be.' "
"When one follows the course marked by the road signs of the gospel of Jesus Christ and places his trust in the Lord, its influence is such that it is manifest not only in action and deed but by a marked and visible change in his very being. There is a special light and a spirit which radiates from his eternal soul. It can be described in words like brightness, light, joy, happiness, peace, purity, contentment, spirit, enthusiasm." LDS General Conference is this weekend at the Conference Center in downtown Salt Lake City. Saturday's sessions are at 10 a.m. and 2 p.m. with a priesthood meeting for male members at 6 p.m. Sunday's sessions are at 10 a.m. and 2 p.m.